Introducing Thursday Sessions for Beginners and New Participants!!! 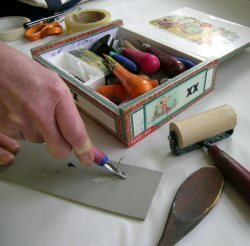 Come learn the basics of linoleum block printing. In four sessions you will learn all you need to know to continue making prints on your own. It is preferred that you attend a set of 4 sessions. Option to continue taking sessions is available. Limited to 6 participants per week. flossie@midcoast.com for more information and to sign up. This entry was posted in 2018, Workshops. Bookmark the permalink.